The iconic Raymond Loewy pencil sharpener is streamlined and futuristic. Its use is intuitive: insert the pencil into the hole, turn the crank. Pencil shavings are collected in the base, which is removable for cleaning. The design never went into production, and its functionality was never realized. The product seeks to transform an everyday object into something people want to display on their desk versus hide away in their desk drawer. Function is used to help users rationalize the purchase; to help justify a visible placement in an office without appearing ostentatious. Loewy’s prototype sold for $85,000 in 2001 at a Christie’s auction. (It did not meet the estimated selling price of $100,000 to $140,000.) The prototype is depicted on a USPS stamp commemorating Pioneers of American Industrial Design that was released in July 2011. 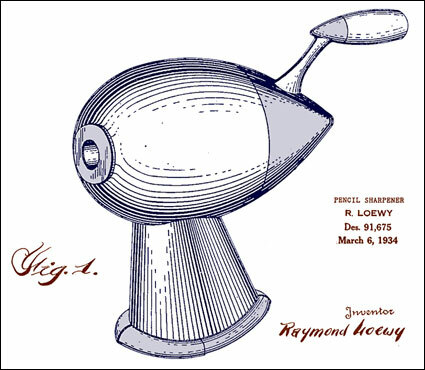 The iconic streamlined pencil sharpener patented by Raymond Loewy in 1934 never made it into production. 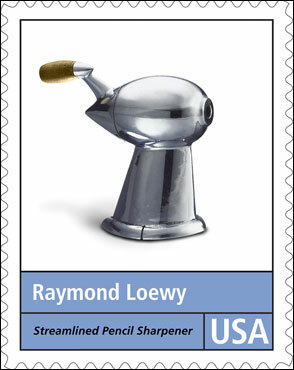 Loewy's pencil sharpener prototype appeared on a US postage stamp in 2011.